Some agile coaches and managers are uncomfortable with setting expectations, offering feedback, and making decisions on behalf of other people, and they go around asking powerful questions. “Who am I tell people what to do in our autonomous organization?” they sometimes say. However, utilizing powerful questions when there is a specific answer that the team needs to arrive at only allows the situation to continue, can damage your relationships, and can subdivide your team. One alternative to asking powerful questions is making powerful observations and in this blog post I share three different examples of how to make and visualize powerful observations. Making powerful observations helps teams see themselves which makes problem-solving much easier. A management team I worked with expressed great frustration over their inability to solve problems but they did not see that this stemmed from their inability to make decisions. To help I visualized the teams decision making cycle time on the whiteboard. I used a timeline and a list to visualize it. As they started discussing a new topic I would plot it on the timeline and add it in the list. The nature of the decision didn’t matter much and as soon as they made a decision I captured the cycle time. 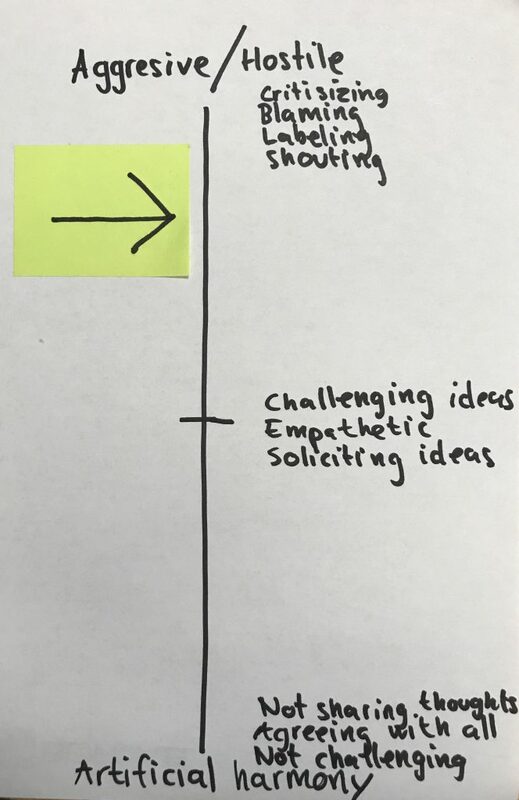 Up until I had visualized this to the team they would not make any decisions in their weekly meetings, but as soon as I visualized it they made their first decision within a few minutes. Topic 1: Product owners and tech leads are in conflict over how much tech debt reduction that goes in the sprint backlog. Decision: Tech leads create a backlog per team about what tech debt that needs to be addressed, with the consequence of not addressing it and with a relative estimate. The product lead sits down with the PO and TL of each team and makes a road map for the coming 2 sprints. This team was able to end their meeting early because they were quickly able to make decisions on this weeks agenda points. Another management team I consulted with expressed frustration over that they were unable to increase the impact that their organization had on their stakeholders and users. The management team said that any decisions they made would not be carried out by the organization. Their view was that this was the result of them jumping between many parallel topics in their weekly management meetings and that this resulted in poor solutions. They wanted help with staying focused and parking off-topic conversations. After sitting in and observing them for a few meetings it became evident that their problem was that they had insufficient representation in the management meetings. 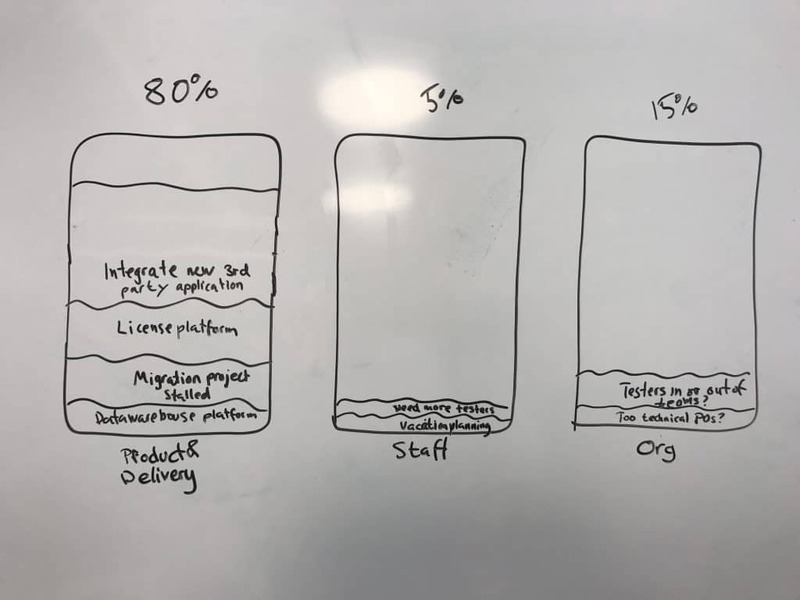 The team consisted of engineering managers only, and tech leads, product owners, scrum masters, and agile coaches were not invited despite that the management made decisions about delivery, product vision, and organization. In their third meeting, I tracked what type of conversation they were having and coded it. To start with I kept it on a high level and I looked at if the discussion was related to product/delivery, staff, or organizational change. Close to the end of the meeting I drew up three boxes (containers) on the whiteboard and helped the team see what they were discussing. The management team was surprised to learn that about 80% of their conversations were related to product and delivery without any representation from at least the product owners. I kept track of which conversations went into each container in case they would ask how I made this classification/coding. Seeing this allowed the management team to reflect upon what healthy balance between the categories looks like but also who should be involved in the meeting. They began with inviting all official leaders and I later heard that split the meeting to allow more focus and to ensure that the right people were involved. A newly formed team I consulted with was storming and their discussion climate was quite unfriendly. People did not speak their mind and silently disagreed which led to decisions not being carried out. To help this group I visualized the discussion climate (as I perceived it). As the climate got more and more aggressive and hostile I would go up to the whiteboard and move the arrow. This helped this particular group to maintain a healthy discussion climate while we outside the meetings could start going to the root of the problem which was the relationship between two of the members in the team. I’ve seen many managers and coaches use powerful questions to help teams understand something specific they are observing but there are many problems with that. It can be perceived as asking leading questions or manipulative, and even if the questions create awareness it’s not what they’re designed for. When there is something specific – share it. Teams are able to solve most if not all of their problems when they know what the problem really is and when they in some way can observe themselves. Powerful observations align a team on the problem, this in its turn engages the team in problem-solving. Great post – thanks so much for sharing this info. I agree that the role of the Coach is also to reflect back what they are observing in a way that can be heard. I particularly like your discussion climate sliders – I’ll give them a try. Thank you, and I agree! 🙂 glad you liked the post!